Medallion Fence is the pioneer in the development and production of ornamental iron fencing. Serving the fence industry for over 50 years, Medallion has long established itself as the leading manufacturer of residential, commercial, industrial and high security ornamental fencing making Medallion the choice of many leading architects and specifiers. For the past 20 years, ornamental iron fencing has been fabricated with steel that has an anti-corrosion coating of either zinc (pre-galvanized) or a mix of 55% Aluminum-Zinc coating better known as Galvalume®. While each of these coatings does provide some corrosion protection, there are however, some inherent flaws and limitations – see Series Overview and Benefits Brochure for details. Medallion has partnered with the best in their respective industries to bring you the ultimate in quality and corrosion protection. ARMOUR-SHEILD™ is synergy of materials and manufacturing processes that is unsurpassed in the ornamental fence industry. 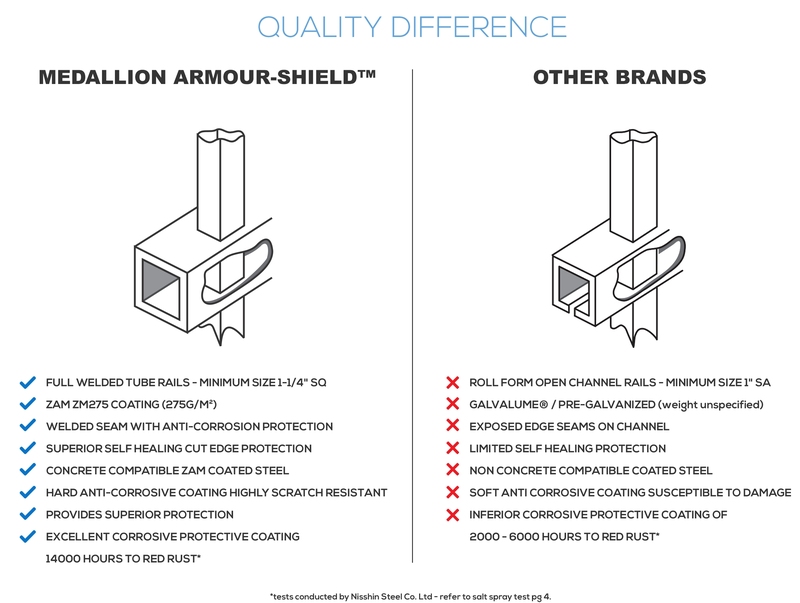 ARMOUR-SHIELD™ begins with ZAM® a Revolutionary, 21st Century Hi-Tech Corrosive Resistant Coating. 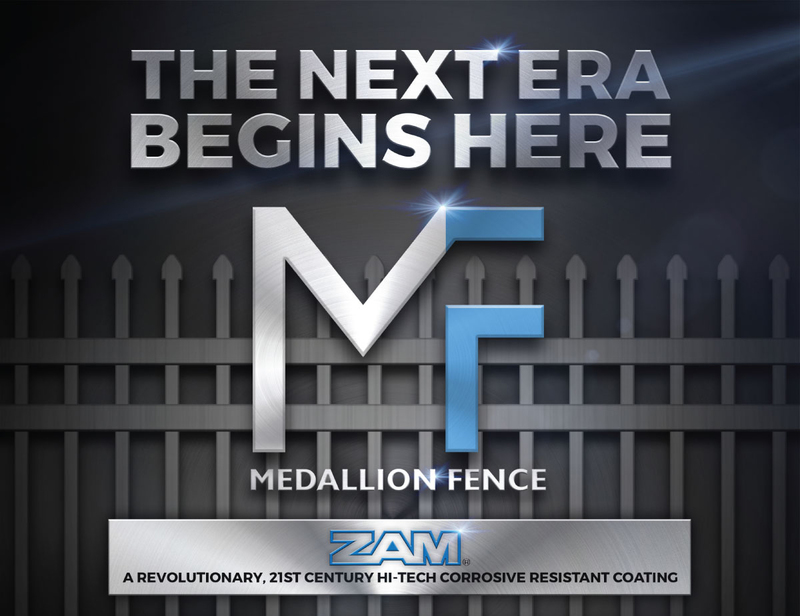 The innovative corrosion resistant alloy coating of ZAM® is comprised of zinc, aluminum and magnesium that creates a highly corrosive resistant barrier. 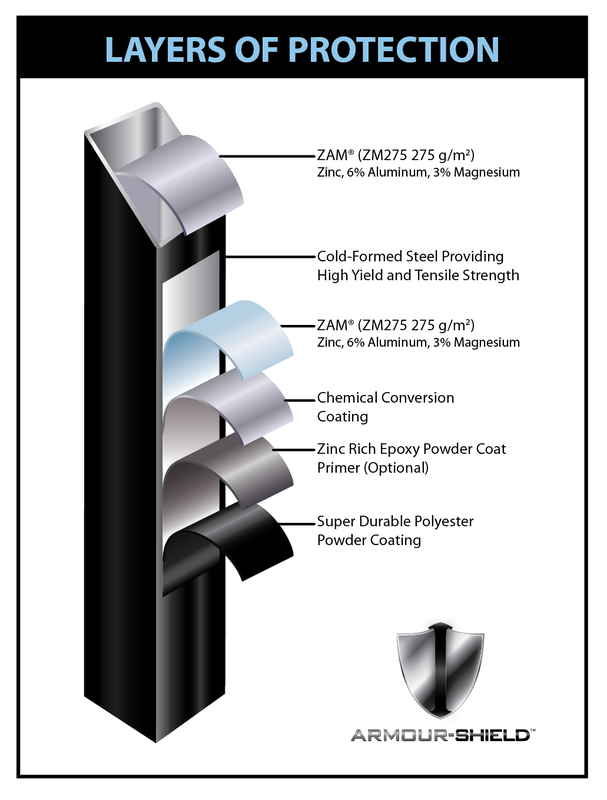 Medallions ARMOUR-SHIELD™ fencing achieves a far superior resistance to rust compared to competitors inferior coated steel. 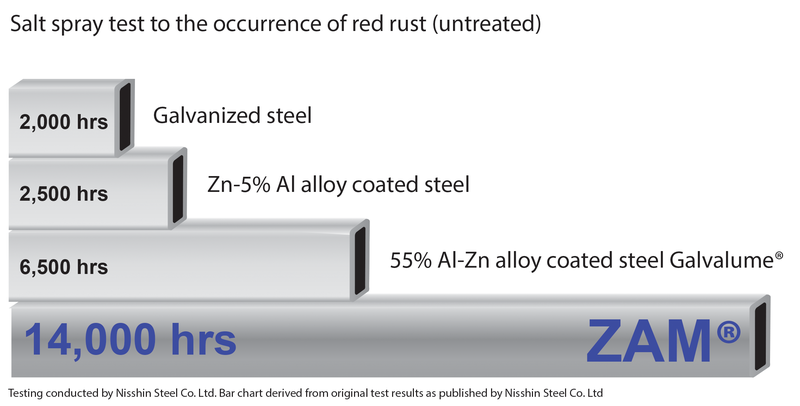 Comparing the salt spray test to the first sign of red rust, ZAM® outperformed Galvanized by 7 times and over twice that of Galvalume®. These results are prior to the application of our super durable powder coat finish, which adds an additional layer of protection thereby further enhancing the corrosive protective properties. As part of our commitment to quality all of our rails are manufactured from electric resistant welded tube whereas most competitive products use a less structurally sound roll formed pre-punched open channel. During the manufacturing process our rails are precision mandrel punched in preparation for picket insertion. To further add to the strength and aesthetic appearance our fencing is manufactured with 25% larger profile rails. Medallions 4000 Series utilizes a 1-1/4” square tube rail as our minimum size, whereas competitors provide a 1” roll form rail.